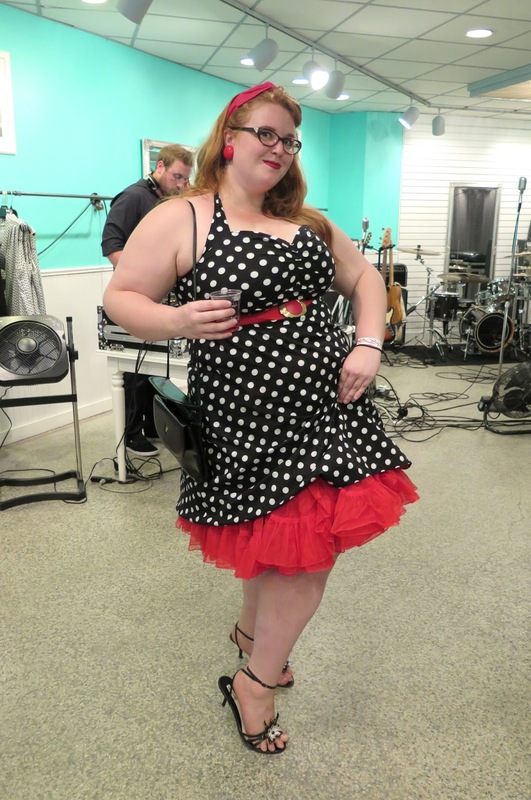 I found this dress at the London Community Players costume sale fundraiser earlier this summer. It was handmade, from a substantial fabric with a unknown fibre content (I do hope it's washable). I loved the colours in the pattern and the basic shape. Even though the fabric is relatively thick, it was very comfortable to wear in 26 degree Celsius weather. I wore it to the Western Fair Farmer's Market with my bestie, and then out for a coffee, and a quick stop at Talize. 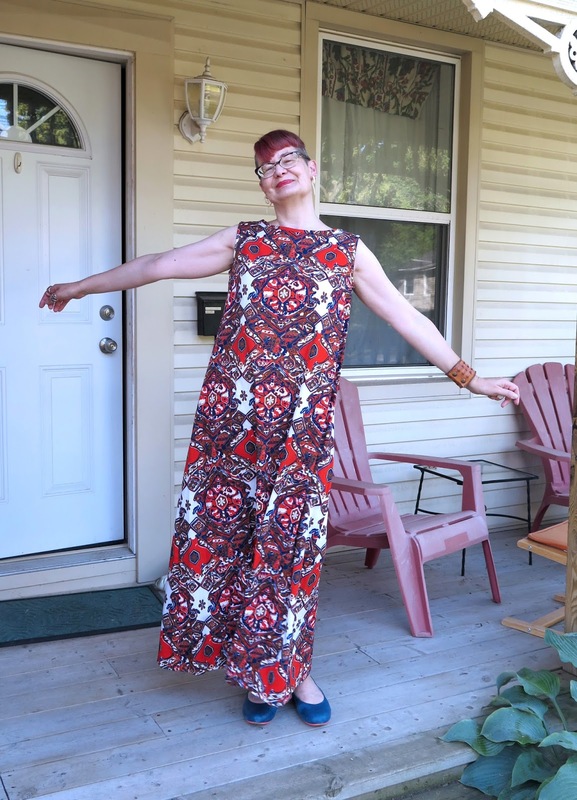 I found this made-in-Zimbabwe dress at a Salvation Army Thrift Store in Toronto a couple of years ago. I didn't try it on, and didn't even know if I would wear it, but I was smitten by the embroidery and the fact that it was under $10. As a piece of art, it was well worth the price. It deserved to have an evening out, so when Christine, owner of Renegade announced she was having a party to celebrate her first year in business, I knew what I would wear. Heather had not been able to attend any of the previous Renegade parties so I was happy she was able to go with me to this one. She looks freakishly tall in this photo (I'm 5'7 in flats) - I'm crediting her platform wedge sandals for the extra height. After seeing this photo I realized the pattern on our dresses seems to be drawing one's eye to our respective pelvic regions. Now that I've pointed that out, you can't stop noticing that, can you? 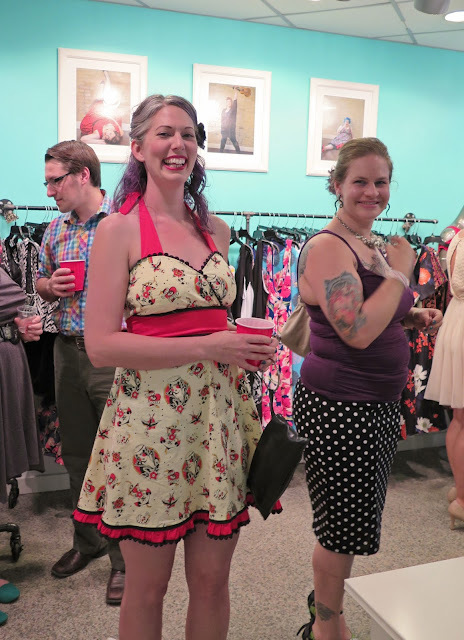 Christine and her partner are very active in the local Roller Derby community so there are always derby girls at the store parties. The gal on the left is Sugared Hits and Reign in Blood on the right. The women at the Renegade parties are always better dressed than those at any other party I've ever attended (not that I go to many parties). 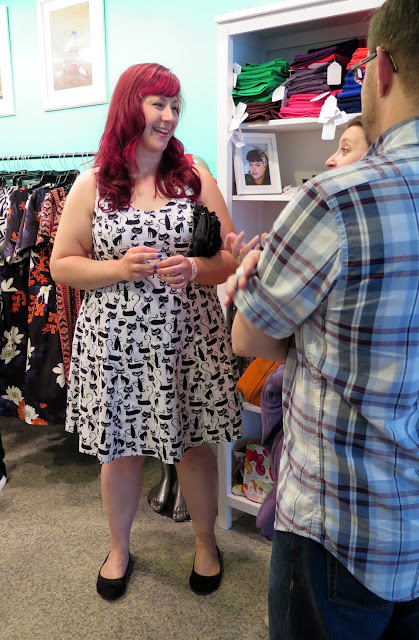 They are thrilled to have an opportunity to show off one of the fun dresses they have recently purchased from the store, like this great cat print one. 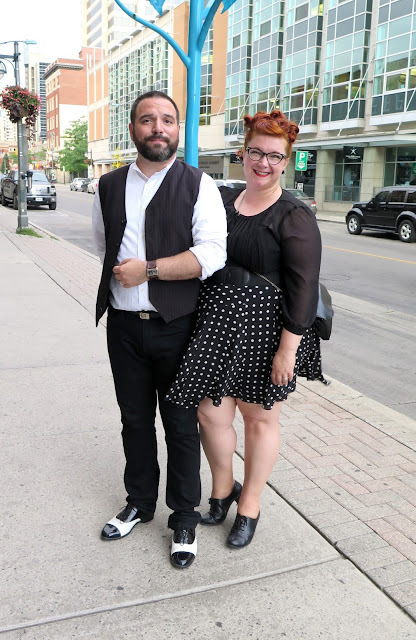 Some people brought their significant others, and Aimee and Dave, who are both very active in the local theatre community, looked perfectly coordinated in black and white. 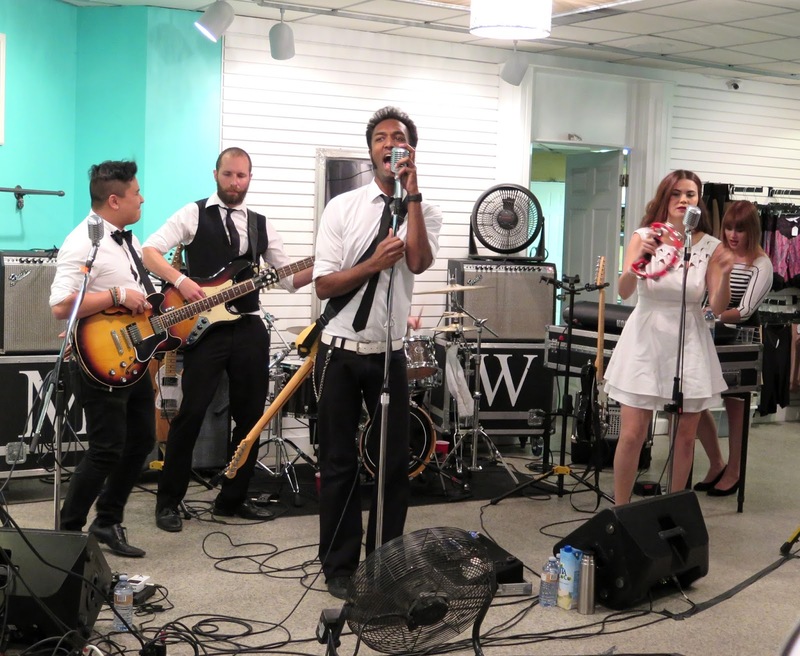 The icing on the cake of the evening was a performance by local band, Marcellus Wallace. Their high energy motown groove had us all dancing, and the fancy footwork and charm of the lead singer made them fun to watch as well as listen to. I had never seen them play before and by the end of their set was an enthusiastic fan. Thanks again to Christine for hosting a great evening of yakking, snacking, drinking, shopping and dancing! Looks like you're keeping busy,and looking fantastic while you do, even in that heat! I love both your maxi dresses. Congratulations to Christine for one year in business. Clearly she's offering irresistible products. 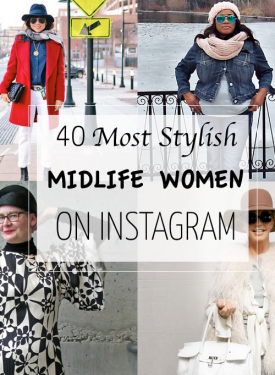 I am happy to see all these stylish women celebrating this achievement. And with outstanding musical entertainment. Your first photo, Shelley, says it all. Cheers! You may not go to a lot of parties (more than me), but you go to the best parties! 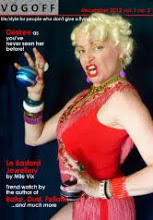 And the best-dressed parties - with the exception of the snakelike earring. Ewwww. Looks like fun, and I hope when people talked to you they didn't just keep staring at your crotch! 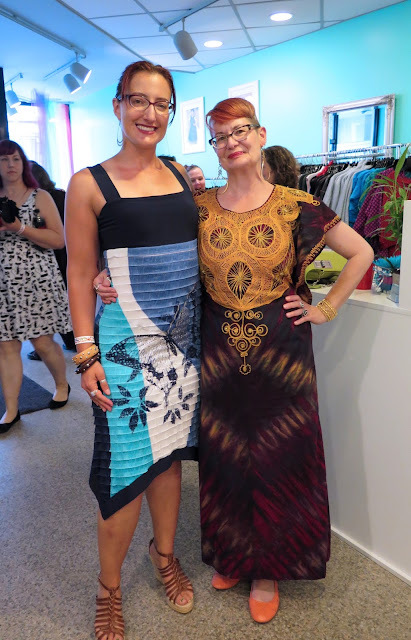 Love both of your maxis - they are awesome for the hot days of summer! 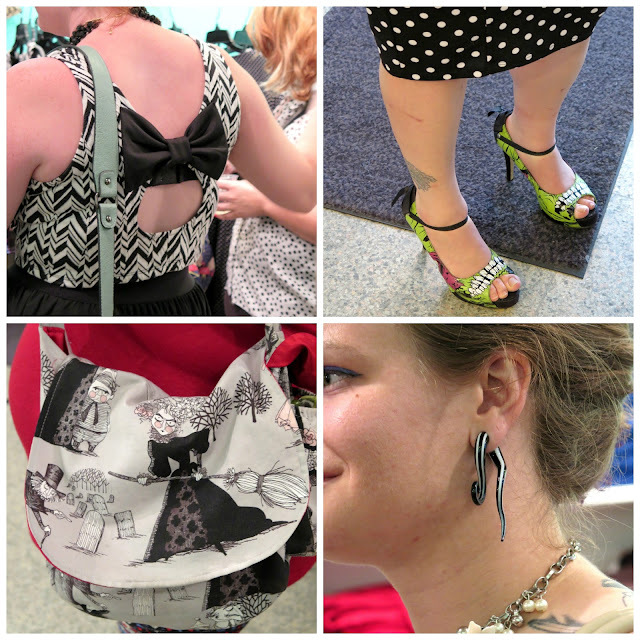 Super style on all the ladies at the party! Love that first photo, Shelley, and the maxi is fantastic! 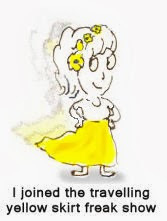 I find myself utterly at home in a full length dress or skirt, they feel just right on me (I reckon it's practice that does it, so keep at it!) The detail on the Zimbabwean dress is wonderful, and it looks great on you. 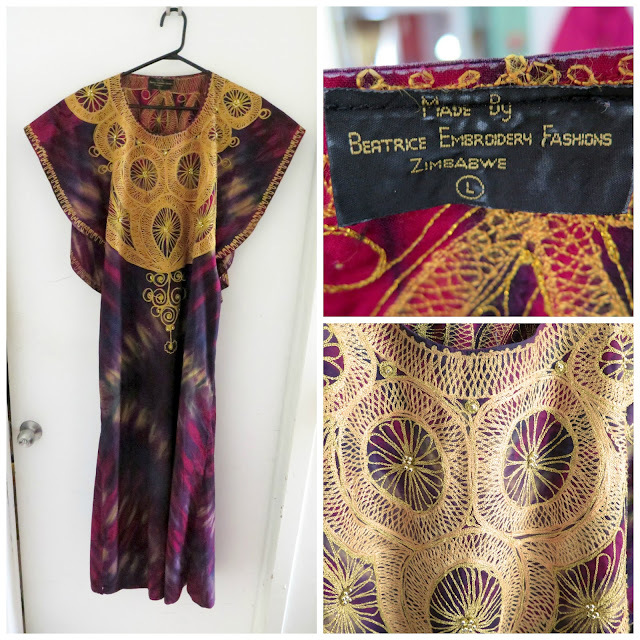 wouuu, such wonderful maxi dresses, you look gorgeous in both of them!, amazing prints and so original embroideries on the zimbawe piece, that's cool! Love particularly the party pics, really fabulous girls wearing fabulous dresses! That African dress looks absolutely wonderful on you, I'd have fought you for that if we'd been shopping together. I've noticed a lot of African dresses have a lot of detail around the crotch area, I wonder if its a very unsubtle way of advertising the female form? Both maxis are outrageously gorgeous on you! And your writing had me laughing during my morning coffee. 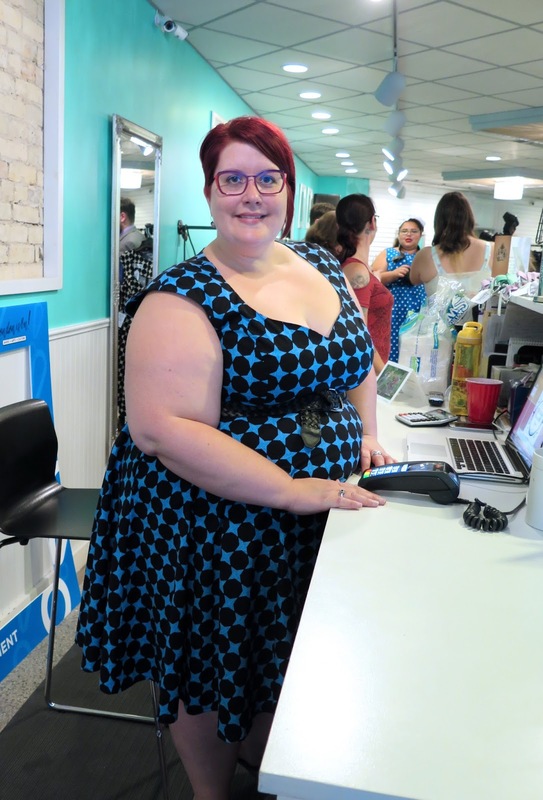 Christine looks amazing as she celebrates her first year of business, and how wonderful that she was surrounded by many who wear her dresses with style. I'm sure you were a head turner on the dance floor! From the looks of things, you're having a fabulous summer! What a perfect day, what a fabulous clothes. The two dresses you wear are both ever so nice. But the second one is downright stunning. Love the orange flats you wear with it. 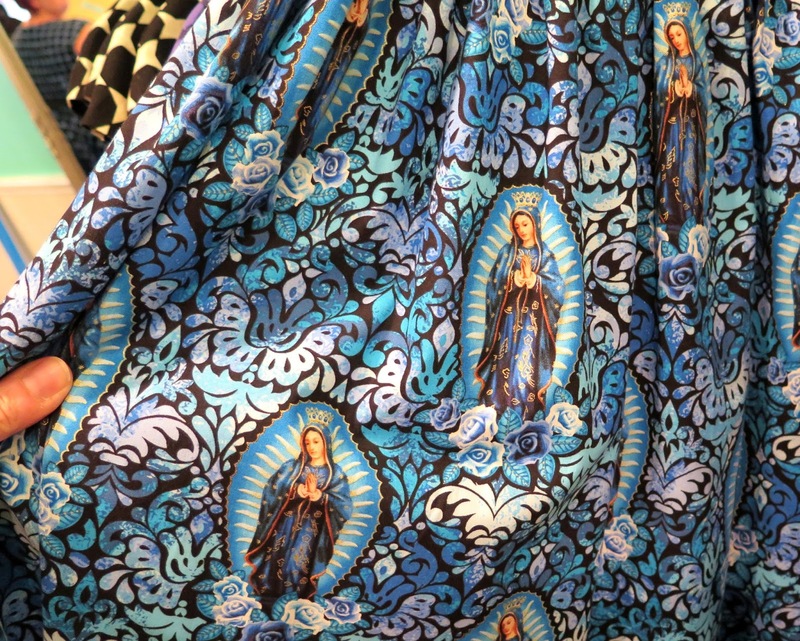 OMG, tha Virgin of Guadalupe print!! LOVE! I love you in both maxis, especially the first! Divoon! It's all down to what one feels best in-I only wear frocks, as I feel bloody hidous in pants, and happily wear maxis or minis or anywhere inbetween! Yays to a fabularse party, it looks like a pile of FUNNAGE! I must say that I am in love with the second maxidress - beautiful details!